Industrial Barrier Curtains help to lower the volume of sound around loud machinery or separate loud objects from other parts of a room. These curtains help to block sound and helps with echo and reverb. These curtains have a combination of our SoundBlocker1 (sound blocking vinyl barrier) which is one pound per square foot, plus it has quilted inside it a sound absorbing padding that can be added to one side or both sides of the curtain. The curtain is covered in a fiberglass fabric and can be manufactured to be weather resistant. We can custom make these curtains to any length. The width can be any size up to 4.5' wide. We can add grommets for hanging, and Velcro can be added for around the edges to create a solid seam to help sound from leaking out the seams. We do sell hanging or floor mounted tracking systems for these very heavy curtains. 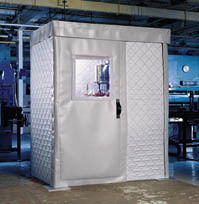 All Industrial Barrier Curtains are custom made to your specifications. These curtains are semi rigid and do NOT bunch up, or accordion fold. 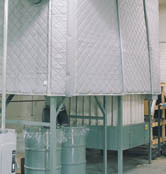 Barrier Curtains can be custom manufactured to meet your needs. These curtains can come with Velcro edges and/or grommets at the top for easy hanging. Custom length are not a problem. If you would like a price quote please feel free to Call, Fax, or E-mail us with your specifications. Please provide information on the size and shape of the space you wish to curtain.